LCR Hallcrest exhibited at the PACE Forum in London February 2012. 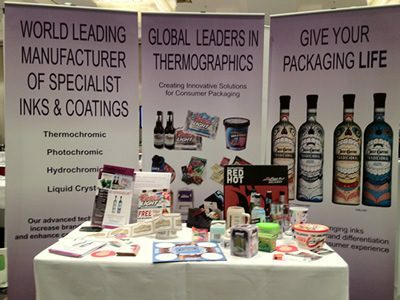 Covered over three days the show was a great success for the Company who showcased their latest developments using their specialist temperature sensitive ink technology within the arena of packaging and labeling. This was our first PACE Forum and it was a good opportunity to make contacts and discuss new packaging ideas. The one to one business meetings with international companies were an invaluable platform to launch and discuss our latest thermochromic inks and ‘intelligent labels’. Our latest flexo and gravure inks for shrink sleeving bottles raise the opportunity for brand differentiation and increasing the user’s product satisfaction, and were one of the latest developments within the industry discussed at the Forum commented Stephen Barker. An excellent mix of companies and contacts were made. Show a great success for LCR Hallcrest.